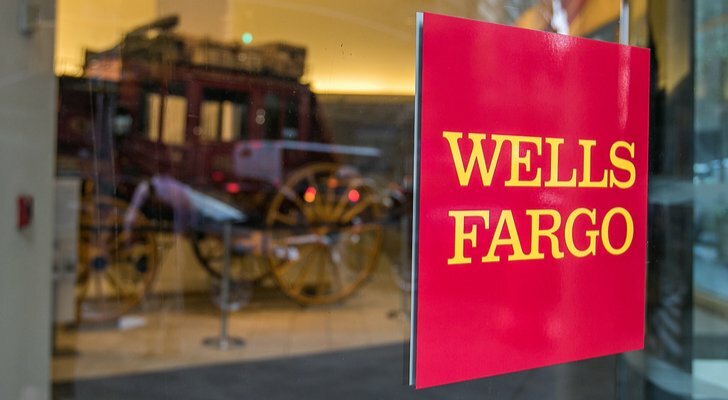 A low valuation and big dividend yield are usually key selling points for a company like Wells Fargo (NYSE:WFC). Particularly during a time of rising interest rates and a strong economy. But for whatever reason, Wells Fargo stock just hasn’t been able to get it going. It’s not just WFC stock either, it’s most of the big banks. Everything from Bank of America (NYSE:BAC) to JPMorgan (NYSE:JPM) to Goldman Sachs (NYSE:GS) have been a disappointment, while most have the same selling points as Wells Fargo. Worse, this group just reported very solid quarterly results and investors still didn’t have any interest. Of the big banks, Wells Fargo stock commands the highest dividend yield, currently paying out 3.2%. However, it also has one of the higher valuations. Trading with a 3.2% payout and at 12.6 times this year’s earnings, that much is true. But how does that compare to its peers? If you want low valuation and yield, Citigroup (NYSE:C) might be your best bet and Morgan Stanley (NYSE:MS) is a close second. For Wells Fargo specifically, its price-to-book (P/B) valuation of 1.44 is second only to JPM, which commands a P/B valuation of 1.57. For the record, WFC stock also has the highest price-to-earnings (P/E) ratio of the bunch, based on this year’s earnings expectations. In that regard, Wells Fargo stock may not be the best bank to buy right now. Bank stocks are under pressure and WFC still hasn’t shaken the stink from its numerous scandals. In that sense, I like growth-banks like BAC and high-quality companies like JPM. 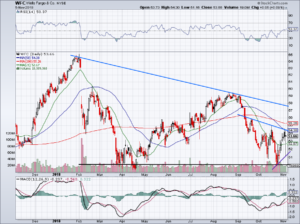 Citigroup and Morgan Stanley aren’t unattractive either. But my point is, if I want to pay a premium for a quality bank, it will be JPM. If I want a low-valuation play, there are options as well. For whatever reason, bank stocks just aren’t coming back to life. Maybe that will change, particularly as interest rates continue to head higher. One note to consider: As short-term rates continue to rise faster than long-term rates, it drives the “spread” (the difference between the two rates) lower. As this spread approaches zero, say, between 10-year two-year Treasuries, banks tend to lose out. So while they make more money from our savings accounts as rates rise, a weakening spread is not their friend. ETFs and plain-vanilla investing are cutting into revenue and the banks just aren’t what they used to be. Perhaps that will destine them to be low-valuation holdings for the foreseeable future. One way for a higher valuation is a higher stock price, but can we get it with Wells Fargo stock? Support near $50 continues to hold and with last week’s higher low, we were able to draw a short-term uptrend line (purple line) for WFC stock. Now what? Well, we have short-term and long-term downtrend lines (in blue). The 50-day was resistance earlier this week and the 100-day and 200-day loom within a few pennies of each other near $55.25. 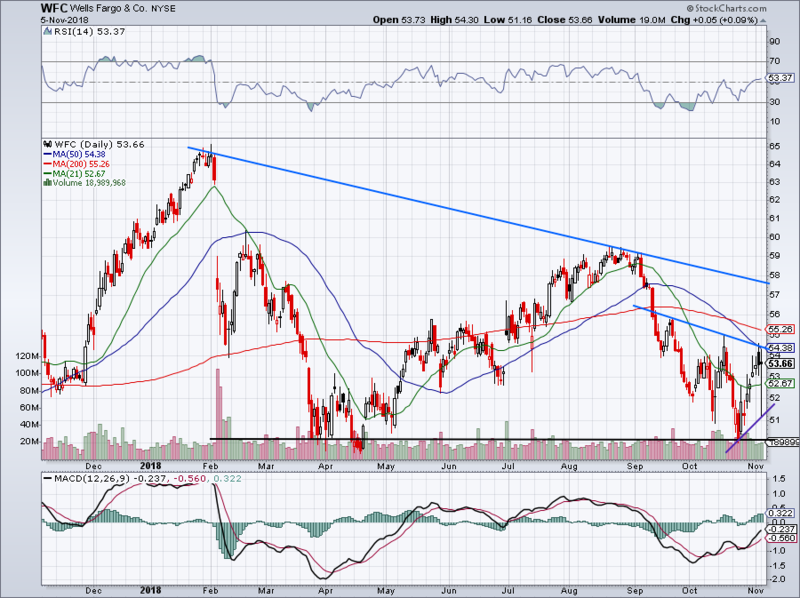 Over short-term downtrend resistance and Wells Fargo stock can make a run at its long-term mark in the upper-$50s. Below the 21-day and uptrend support is likely in play. Below that and support near $50 is back on the table. Bret Kenwell is the manager and author of Future Blue Chips and is on Twitter @BretKenwell. As of this writing, Bret Kenwell is long JPM.